We found the best beaches in Lebanon. They have white sand, clear water, and breathtaking views of the Mediterranean. They’re lined with ancient Roman architecture. Pastel-colored buildings, a lively souk, and seafood restaurants fill the nearby Old Town. While a little boutique hotel overlooks them from a peninsula that juts into the sea. Tyre sounds like a perfect weekend getaway. 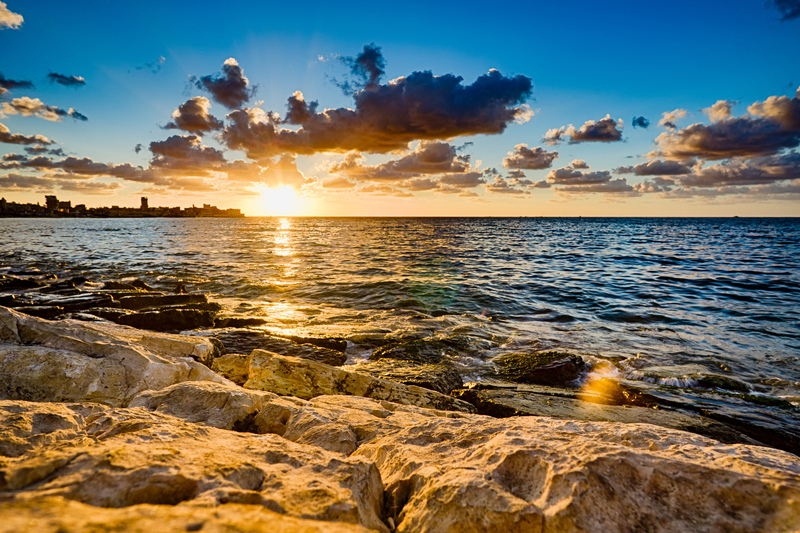 The Queen of the Seas, which lies 50 miles south of Beirut near the border of Israel, is more than 4,000 years old. It was founded around 2750 BC and became known for a rare, expensive purple dye made from murex sea snails. Everyone from the Phoenicians and the Persians to the Romans and the Ottomans seized control of the city before Lebanon was established in 1920. Tyre is now a major port and the Middle Eastern country’s fourth-largest city. The historic city is also a UNESCO World Heritage Site. The Al-Bass Archaeological Site—Tyre’s most famous spot—is a funerary complex full of ancient tombs. A well-preserved Roman aqueduct, monumental arch, and road stretch beyond the site. The road leads to a hippodrome, where horse and chariot races were held. The Tyre Coast Nature Reserve lies south of the city. Arabian spiny mice, migratory seabirds, and endangered loggerhead sea turtles are protected among its nearly 1,000 acres. Then there’s the peninsula itself. The rocky formation (Tyre actually means rock) is where the city was first established. The ruins of its former Phoenician port and hot springs lie near the southwestern tip. The Christian district (most people here are Shia Muslims) is on the west coast. The small enclave has narrow streets and hidden shops. It’s next to the souk, where freshly caught fish is sold early each morning. While a small white lighthouse—the perfect spot to watch the sun set—is perched on the northwestern tip. Dar Alma is just steps from that lighthouse. 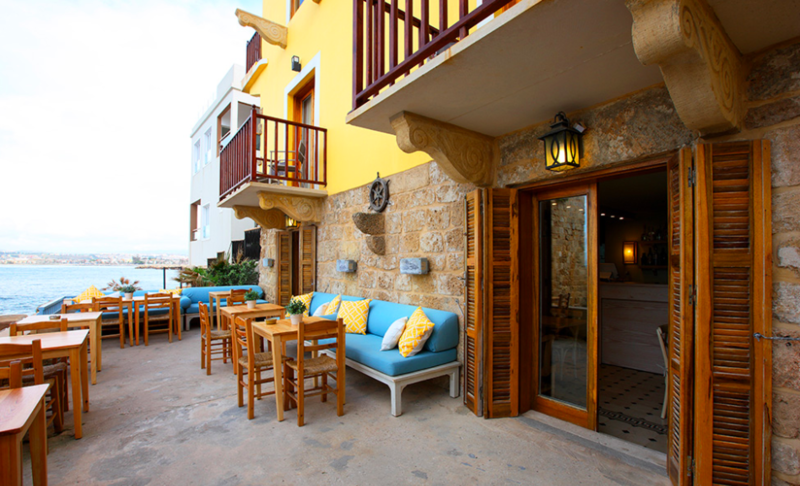 The boutique hotel sits at the end of a little alley near the remains of a Crusader castle and a Venetian cathedral. Its bright yellow building is historic, of course. The stone walls and the Lebanese tiles inside haven’t been touched. Much has been added, though. Lebanese furniture and comfortable beds fill the 11 rooms. French doors open to balconies that overlook the sea. Crashing waves act as soothing background music. The basement has been turned into a seafood restaurant. It has little wooden tables, bench seating, and a small bar tucked underneath its low ceiling. The space is adorable, but you won’t want to eat here once you see the beach terrace. It’s where turquoise-cushioned couches and yellow pillows are set out in the sun. Breakfast is served here in the morning. You’ll request fattoush, seafood linguine, and a dry Lebanese white wine later, as well. Plus, in between the terrace and the water, there’s a sun deck, where you can either borrow fishing equipment or relax on white sun loungers. You could definitely use a little sun before you start exploring all the gorgeous beaches tomorrow.